Apple Valley Medical Center Blog Beware of Lyme Disease. Summer is here, and so is tick season. Deer ticks can carry the deadly Lyme disease. If you live or vacation in grassy or heavily wooded areas, please remember to wear long pants and long-sleeved clothing when in the woods. Check your body for ticks when you come inside. If you find a tick, remove it immediately. 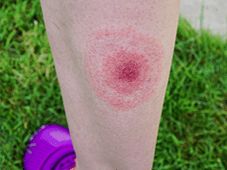 Bites that result in Lyme disease often start as a small, red bump just like any other tick bite. But over time, the redness may expand into a bull’s-eye pattern. This is a hallmark of Lyme disease and means you should see a doctor right away. You also may develop fever, chills, fatigue, body aches and headache. Treatment with antibiotics generally cures the disease, but the sooner you start taking the medication, the quicker you will feel better. Call us if you notice any of these symptoms. 952-432-6161.